Craning boats out of and into the water - either for maintenance and repair, or onto / off road transport, or to go into hard-standing storage in our yard. 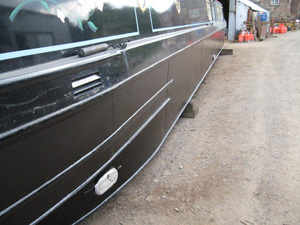 Hull Blacking - steam clean or grit blast, conventional bituminous paint coating or two pack pitch epoxy coatings, we can also clean and coat the whole of the baseplate if required, as well as the hull sides, bow, and stern. Hull inspection - as part of any 'out of the water' job, we will inspect the sterngear and rudder system of the boat, together with the state of the steel hull and advise if any remedial work is necessary. 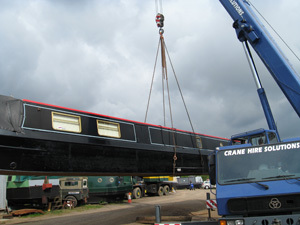 Hull surveys - boats are craned onto heavy duty stands 1m high to give unrestricted access to the baseplate. The hull is steam cleaned and a grid of test patches is ground back to bare steel, this also exposes any corrosion pits in each test area. The steel thickness is then measured using a Joel UT3 ultrasonic thickness test instrument and results are plotted on a boat plan. The depths of a representative sample of any substantial pits is measured using a digital caliper and recorded. This enables us to give a pass / fail assesment for the survey as a whole. Rudder replacement - if the rudder system is loose, worn or damaged, we can replace it with a new rudder post, skeg bush and top bearing, with a balanced rudder blade fully welded to the new post, ensuring a robust system with a long maintenance-free life. Stern tube replacement - if a stern tube is badly worn or corroded, replacement is essential to avoid continual water leakage and excessive vibration when in gear. It may be that the steel boss is unusable in which case we can cut the old one out and weld in a new boss using side cheek plates to ensure a robust and leak free repair. The new internal parts of the sterntube are then fitted and the prop shaft and propeller re-fitted or replaced as necessary. It is usually necessary to replace the prop shaft if the sterntube is worn, as the surface of the old shaft will be damaged. Engines - we can service your engine, carry out any required repairs, or even fit a new replacement engine for you. 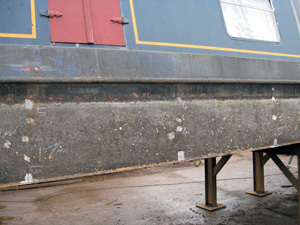 Overplating - if, as a result of collision, or the hull is holed, or a poor hull survey result shows it is below the minimum safe thickness in areas, we can overplate part or all of the hull to bring it back to a safe condition. The boat is on our heavy duty stands which allows us easy access to both the lower hull sides and the base plate. For the under-plating, the plates are fully welded along their edges and also have square "puddles" cut out along the centreline, the edges of which are fully welded before the square is welded back in. This ensures that the new plating is more firmly attached to the boat's structure. For side plating we often weld new rubbing strakes at the top and bottom of the side plating. The top strake provides an excellent cosmetic finish to the job and provides extra strengthening of the hullside in the impact zone, and the lower strake acts as a new heavy duty wearing edge for the baseplate edge weld, which is often badly worn away by the time plating has become necessary. Electrical repairs - we can replace batteries, cabling, switch panels, and worn out lights and pumps. Advice is always given on achieving an electrical system that meets your needs safely and efficiently. We can also install or repair 230v systems, inverters, and fit a galvanic isolator to the shore line if your hull is suffering from galvanic corrosion, together with the necessary earth bonding for safe operation.